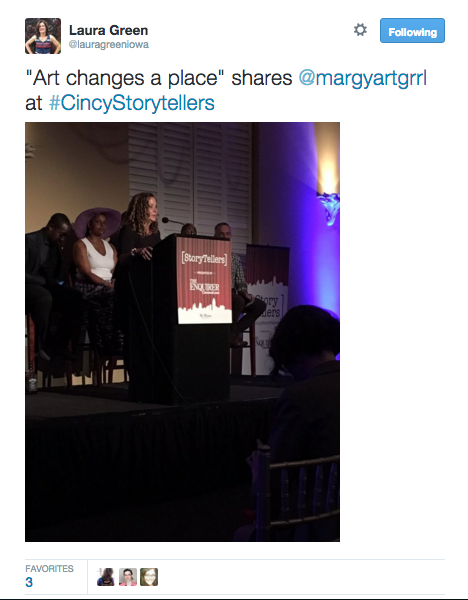 Cincinnati Enquirer invited me to tell a story as part of the Downtown Dreamers Cincy Storytellers evening. This is a story of concern about what’s happening in my rapidly gentrifying place and a small step toward strengthening that neighborhood with community-created, serendipitous art. 2003. It’s the end of the day and my work is done and I’m squeezing in some shoe shopping in Soho before walking to the theatre which is basically what I do in any city—wander and see art. All of a sudden this shoe store is filling up with people. It’s just a big open space with a few dramatically placed tables with beautiful shoes on them, basically a shoe gallery. Now, hundreds, I’m not kidding, hundreds, of people poured into the space. They filled it up until they could barely move, took photos and talked on their phones. They stayed about 5 minutes and then they all walked out and disappeared on the streets of NYC. The other two shoppers and I are just watching with our eyes wide. I had no idea what was going on but I was grinning and full of joy. It was so exciting to be in the middle of the experience. Later I learned that this was one of the first flash mobs ever, in the place the performance art form was born. It changed my memory of that place and I think of it every time I pass that corner, though the shoe store is long gone. That’s the power of art, and especially art that’s co-created and serendipitous and participatory. Flash forward. I leave the east coast, where I’d been living and working on urban and social policy issues, researching welfare and poverty, and move to Cincinnati for a dreamy job in the arts. I wasn’t even sure I could return to my home town, but one walk from our public square through downtown and the historic neighborhood of Over-the-Rhine on a weekend visit showed me how much the city had changed. And was continuing to change. It was becoming the kind of place I’d left it to find. A place you can live and walk and ride a bike and have a life of connection on the sidewalks. Five years later, downtown and Over-the-Rhine are changing so fast we’re spinning. We’re saving the unique historic neighborhood and buildings and that’s wonderful. But what’s troubling is something happening on the sidewalks. All too frequently I watch as people miss each other. They are walking down a sidewalk or playing in a park, but it’s as if they can't see one another, like they are invisible to each other. And at our neighborhood community council in Over-the-Rhine, the people who come to monthly meetings no longer reflect the diversity of our neighborhood. There are more new residents, white people of relative means, than there are long-time residents, and residents of the housing that’s affordable to people working for employers who don’t pay much. Our council recognized this stress and we set out to create an experience. An experience designed to build community. An experience built on that moment in a shoe store in Soho. At a monthly meeting, we asked everyone to sit with someone they didn’t know and gave them about 5 minutes each to share what they love about Over-the-Rhine: the people, the places, the buildings, the stores, the parks, their memories...whatever. There were a few, just a few, people who didn’t want to play. They stood apart from the rest of us, which was sad. But, the people who were talking were engaged and loud. We gave everyone some tools for artmaking—colored pencils and crayons—and asked them to draw or write what they’d heard from their partner. We handed them pinwheels and asked them to attach their art to the pinwheels. 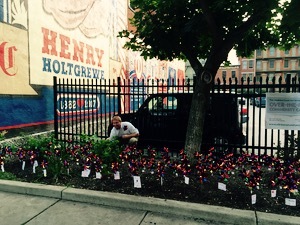 Then some of us took all those pinwheels to Vine Street, in the block of Over-the-Rhine that’s arguably changed the most, between 12th and 13th—and planted a pinwheel garden in a patch of dirt in front of a parking lot. We put up a sign that said This Neighborhood Fun Brought to You by the Over-the-Rhine Community Council. 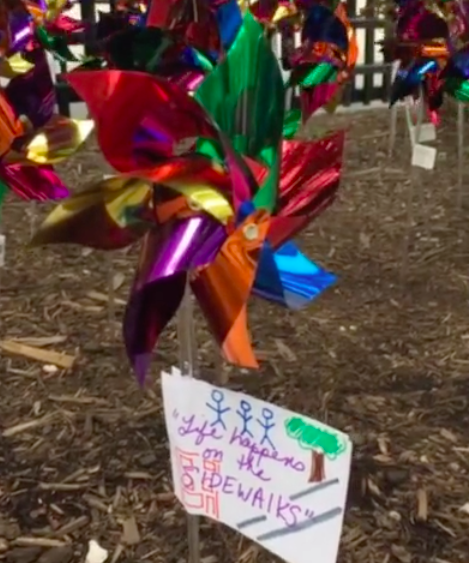 The pinwheels were an attraction, bright and colorful like candy, spinning in the breeze, a little bit of surprise art by the sidewalk. We did this because we’ve learned that creating something together, sharing the experience, gets people talking. It creates a stronger community, and gives us the opportunity to open the door to talk about other things, to working together on making the neighborhood we want to live in, to focusing on equitable development, not just economic development. I stalked that little patch of garden. I watched people stop and look at it, take pictures of it, wonder about it. They talked to strangers standing by them about it. They met and were able to see each other. And occasionally an adult took a pinwheel and gave it to a child who carried some happiness off into the neighborhood. We thought the summer rain might batter the garden or that all of the pinwheels might disappear at once in a late night prank. But that’s not what happened. The pinwheels were sturdy. The garden did get smaller week-by-week as people took a little bit of the joy out into the neighborhood and home with them. Until one day, riding by on my bike, I saw just one pinwheel left—spinning in the breeze. It made me smile. A little later, as I was heading home, I saw little girl walking on the sidewalk, clutching that pinwheel. She’d gotten the last bit of joy out of that community created, serendipitous art—and she was sharing it with everyone she saw. And everyone could see her.